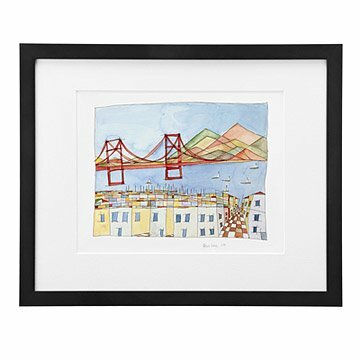 This print frames the Golden Gate Bridge with the Victorian architecture and rolling hills of San Francisco. In the artist's opinion, the opening of the San Francisco Bay to the Pacific Ocean provides "The Perfect View" of the Golden Gate Bridge when juxtaposed with the beautiful Victorian architecture and the steep, rolling hills of San Francisco. This beautiful print is even nicer than pictured at the UncommonGoods site. In addition to the signature of the artist and year of the printing (as shown on the website), the number (e.g. 22/250)and name of the piece (The Perfect View) are entered below the print by Renee Leone. The piece arrived safely packaged and in perfect condition. It was worth the wait!